Normal height adjusts from 28" to 37"
Tall height adjusts from 37" to 46"
Bariatric Cane with Offset Handle by Drive Medical has a 600 pound weight capacity, and is adjustable from 27.75" to 36.75" (or 37"to 46" for the tall version). It is constructed of a durable 1" steel tubing, and features a comfortable vinyl hand grip with a wrist strap. It also features a locking ring for added security and safety when using after adjusting the height. The height is easily adjustable by a simple push button release. It also comes backed by Drive Medical's Limited Lifetime Warranty. 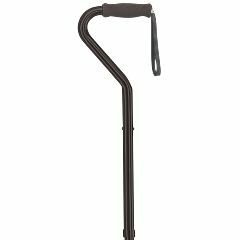 For a durable, long lasting, bariatric cane, look no further than this cane, and pick one up today.